Obama White House Accused of Federal Crime — By Democrats! Reported by American Spectator’s Jeffery Lord, Democrats are accusing the Obama White House “of offering high ranking government jobs in return for political favors,” in violation of Title 18, Chapter 11, Section 211 of the United States Code. This is the second time in 5 months the Obama White House has been accused of such misconduct. U.S. Rep. Joe Sestak accuses “the Obama White House of offering him a federal job in exchange for his agreeing to abandon his race against Arlen Specter,” who is supported by Obama. 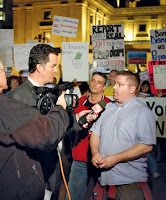 It was reported in August 2009 that Colorado Democrat Andrew Romanoff was “offered specific suggestions” for a job by Deputy White House Chief of Staff Jim Messina if he would abandon his challenge for the seat Senator Michael Bennet was apointed to when Ken Salazar was appointed as Secretary of the Interior by Obama. Although an egregious violation of law, it is doubtful the Department of Justice will allow themselves to be bothered, as evidenced by the dismissal of the voter intimidation case against Obama supporters in the 2008 election. In a manifestation of poetic justice, and high irony (or high comedy), the ACLU, which has sued so often to kick the Boy Scouts out of public schools because of their pledge to do their duty to God and County, and sued to rid the schools of any prayer or reference to God, was figuratively kicked out of the West Sylvan Middle School in Portland. I am pleased to report this fact on George Washington’s Birthday. The story of this travesty of civil rights may be briefly stated: I received information that the ACLU, had through some means, managed to have a poster posted in the school itself — Yikes! — advertising itself and urging kids to join or support the ACLU, which by its secular-cleansing fanaticism has modernly become the Taliban of American Liberal Secularism. Therefore, I made citizens’ complaint to the administration of the school, calling for investigation and action. I pointed out to the principal, who said she was not aware of the ACLU’s propagandizing the children and soliciting support, that while the ACLU had waxed wroth at Boy Scouts meeting at schools, or at prayer being uttered, even muttered, or —Gadzooks and Horrors! 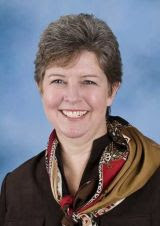 — the mention of God out loud in schools, the ACLU was apparently soliciting the children to its secular humanist views, having kicked out anything having to do with faith, other than the secularist faith preferred by the ACLU, which it enforces by its politically correct lawyer-police, akin to the religious police of the Ayatollahs. Thus, the ACLU, wrapped in its elitist liberal secularism and sneering at people of faith, was seeking for itself and its ultra-secularism what it so consistently has sued to deny others of a different view — diversity of any belief other than atheistic or agnostic secularism apparently anathema to the modern ACLU. I pointed out that the ACLU could not arrogate onto itself what it denied to others of a different view by soliciting children in the school support or join ACLU. Among other things, I referred to the fact that the U.S. Supreme Court has found that secular humanism is a religion, as belief in a deity is not required under Establishment of Religion Clause decisions. 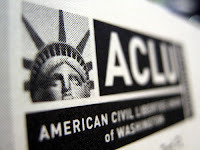 Further, the Sixth Circuit Court of Appeal has held that ACLU’s views of what does or does not constitute an Establishment Clause violation is not to be accepted for the reason that the ACLU by its excess of zeal in suing displays of the Ten Commandments and other symbols of our American religious history heritage in schools and in the public square generally, has disqualified the ACLU from meeting the “reasonable person” standard for determining whether there has been an unconstitutional communication to endorse religion. Thus, I asked for an investigation of whether such an ACLU solicitation was being visited upon the children by some liberal secularist let loose upon the innocent children, perhaps an NEA-union activist aware of the close ties between the NEA, the ACLU. I asked further that if an offending poster was discovered, that it be removed forthwith, consistent with the ACLU’s secular-cleansing of the schools of such menaces as prayers, the Ten Commandments, Boy Scouts, or the symbol of the cross in relation to honoring veterans. I am pleased to report to all good civil libertarians who believe in the Constitution as it was written and intended by the Founding Fathers and not as interpreted by the Founding Communist of the ACLU, Roger Baldwin, and successors, that I received a voice mail message today from the principal who informed me that she had investigated; had confirmed the presence of the ACLU’s poster soliciting children to support or join it; (a shriek of outrage would be appropriate here); and that she, the principal, had removed it. I am gratified to report this victory for civil rights as a career-long civil rights/workers rights/ veterans rights attorney, and a once upon a time staff attorney of the ACLU Foundation of Southern California before the ACLU drank the Hollywood Kool-Aid of fanatical secular-cleansing lawsuits under the Establishment Clause by which it has enriched itself with enormous profits by judge-ordered, taxpayer-paid attorney fee awards, i.e., “awards” in the millions to drive Boy Scouts, prayer, the Ten Commandments, out of schools or destroying crosses honoring veterans at memorials. The sword of justice is unsheathed…. Thanks to an alert 5th Listener who sent this to me Here.